I just did some sneaky googling of my book, and found a TON of blog mentions that I’d never seen before! I was so ridiulously gleeful about it that I had to make a post. LOOK AT ALL THE LOVELY PEOPLE EXCITED FOR MY BOOK! I recently posted about the historical events and locations in The Next Together, so I thought I’d explain how I did my historical research. If you asked my editor and copyeditor, they’d likely admit that I’m not the best at historical accuracy. I’m not a historian. Anonymous asked: Is there anything in the final version of The Next Together that survived all the way from that first draft of The Red Earth Rolls, or has it all been changed? (Also, can you explain the change/meaning of the titles?) Thanks! Yes! There’s lots of scenes which made it from my very first draft, usually the more romantic, banter-y scenes, because they weren’t affected by the plot changes. I think all three of my favourite scenes were actually from the first draft. There’s one particular scene from the 1745 storyline, where Katherine and Matthew have a very flirty hand-holding carriage ride, which I fought really hard to keep. It was one of the earliest scenes I wrote, and it was the first one that really felt like I’d found My Voice, and might actually be able to do the whole writing thing. The scene nearly had to be cut because it didn’t really fit the plot anymore, but I did a lot of frantic adjusting to make sure it could be kept. Here’s one scene that I’m really sad to have lost, but it just didn’t work! Everyone thought that was a bit too literary for YA, and might put off younger teenagers, so my publisher asked me to change it. How many times can you lose the person you love? Maybe the next together will be different. I was really sad to lose The Red earth Rolls at first, but now I absolutely love The Next Together, especially after seeing it on a cover! cracked: But come on, it’s not like they can just turn male scientists characters into female scientist characters whenever they want. Anonymous asked: was the next together the first novel you’ve finished/written? It was, but it took a lot of drafts to arrive at the final version! I originally started writing it when I was 16, and began to write it “properly” when I was 18. Reincarnation was always an idea I had knocking around in my head from a young age. Anonymous asked: How long did it take you to write The Next Together and how long after that did you get your agent? 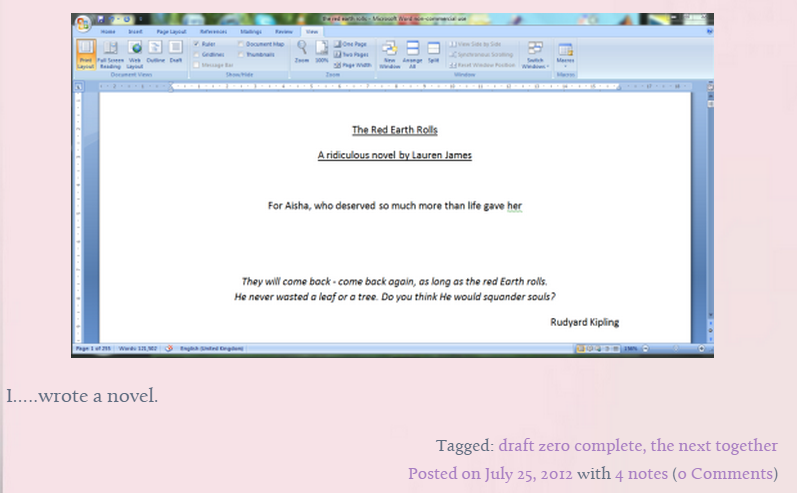 I wrote The Next Together, then called The Red Earth Rolls, in my first two summer holidays at uni, so around 4 months total. I spent 2 years thinking about it inbetween writing, though! We revised the manuscript throughout 2014 (because I was busy at uni and couldn’t do anything until the summer) and sent it out to 12 UK publishers in November 2014. Walker offered me a book deal 2 weeks later! And it’ll be published 2 years after I finished the first draft. Hope that answers your question! If you want to know more about the querying process, let me know, I’ve got a ton of links I can share with you. My second novel has an LGBT protagonist. I have something that I guess is an announcement, but I don’t really think of it like that. It’s just something I’ve not mentioned online before. Ever. My second book, the sequel to The Next Together, which doesn’t have a firm title yet, has an LGBT protagonist. The main character is a lesbian. My page proofs are the prettiest thing in the entire world. This is my BOOK, it’s REAL. Bringing this back because I just remembered it exists: this Lynx/Axe soulmates advert is the perfect trailer for my book The Next Together. Just….just watch it. You’ll see. 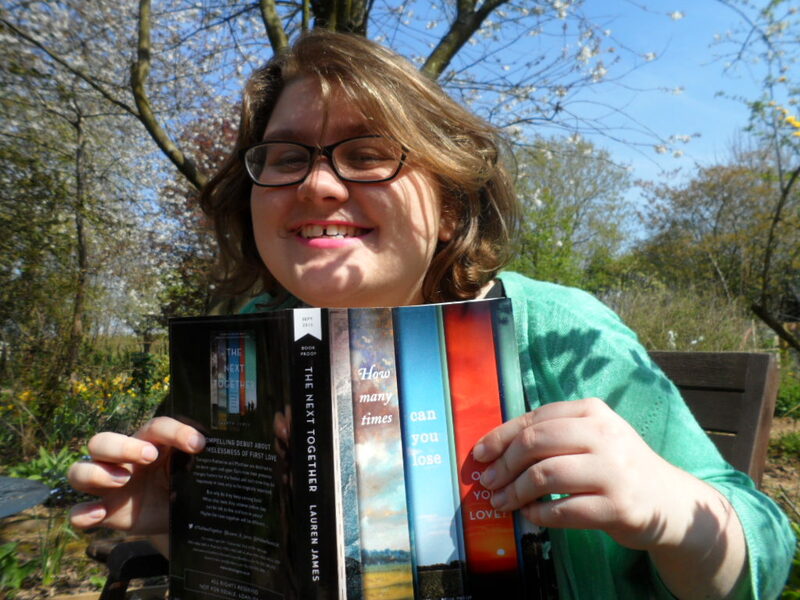 A little ten question interview I took part in for my local Waterstones posted yesterday! 1. DESCRIBE YOUR NEW BOOK IN 3 ADJECTIVES. 2. WHAT WERE THE CHALLENGES OF WRITING THIS NOVEL? I had to do a lot of historical research as the book contains two plotlines in the past, one in 1745 during the Jacobite Uprising and one in 1854 during the Crimean War. 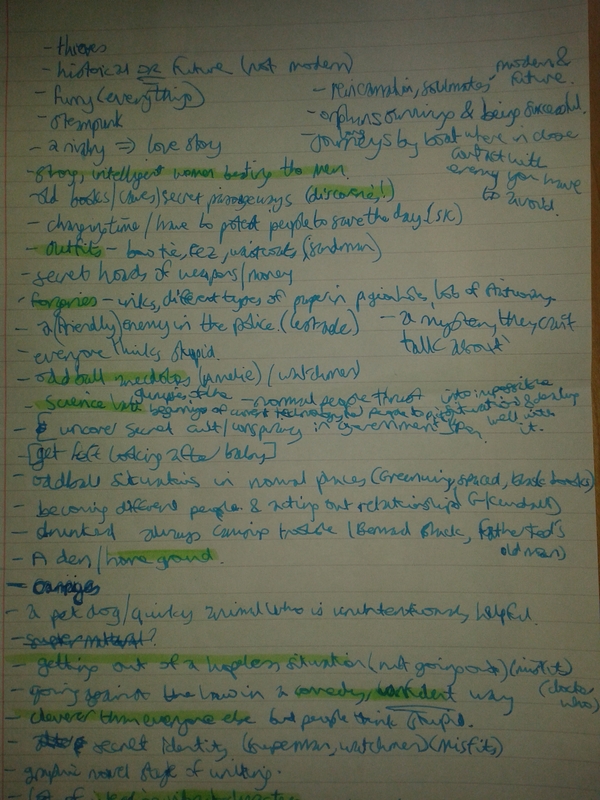 Writing it was a very messy process involving a lot of Wikipedia and trawling through history books. 3. WHICH NEW UP AND COMING AUTHORS DO YOU LIKE? I love Catherine Doyle, Alice Oseman, and Louise O’Neill. Brilliant young authors who are also very cool! 4. WHO IS YOUR FAVOURITE CHARACTER IN YOUR BOOK? 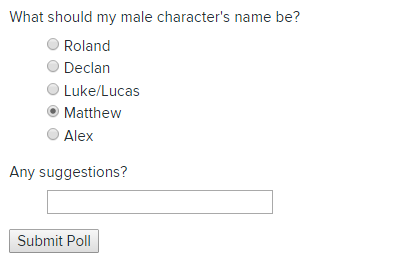 I don’t know if I can choose between my main characters Kate and Matt . . . this is too hard! They are the best as a pair. 5. DO YOU HAVE ANY WEIRD WRITING HABITS? I write at night. I’ve tried writing during the day, but I’m totally unproductive until the sun has gone down! 6. WE’VE HAD VAMPIRES, WITCHES AND DEMON HUNTERS – WHAT DO YOU THINK WILL BE THE NEXT YA TREND? Mental illness seems to be the new trend, like the recent books All the Bright Places and I’ll Give You The Sun. 7. IF YOUR NOVEL WERE TO BE ADAPTED WOULD YOU PREFER MOVIE OR TV SERIES? DO YOU HAVE A DREAM CAST? I’d prefer a TV series just because I’m greedy and would want it to be as long as possible! I spend a lot of time thinking about my dream cast, it’s probably unhealthy. 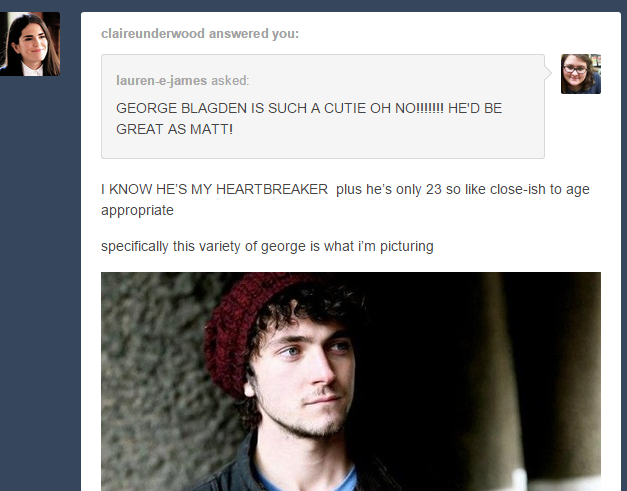 I see Kate Finchley as a young Gillian Anderson, Matt Galloway is Ben Whishaw and Tom Galloway is Dylan O’Brien. 8. WHY DO YOU THINK YA FICTION IS SO IMPORTANT? Young Adult fiction has the huge responsibility of being read by teenagers. The right book can shape a young person’s ideas about important issues like feminism, homophobia, sexual assault and mental illness for the rest of their lives. If you read the right book at exactly the right age it can stay with you forever, and YA does that really well. 9. WHAT CAN YOU TELL US ABOUT YOUR NEXT PROJECT? Right now I’m working on the sequel to The Next Together, which has an LGBT protagonist! I wrote a blog post about it here. I can’t say much more than that without spoiling something though, sorry! Love transcends time and space and social constraints, even when the world is working against it. My cover is being revealed in SEVENTEEN DAYS on Friday the 13th along with the first chapter of The Next Together!! Are you ready?! I’m not. Anonymous asked: Are you happy with the cover for TNT? I am! I absolutely love it. Every time I look at it I can’t believe that it’s really my book. It looks so mature and sophisticated and special. The designer (the fantastic jackdraws) went through a series of different ideas, and I loved each one more than the last. It was kind of heartbreaking that we couldn’t use them all. Sixteen days until you can all see it!! Anonymous asked: WHEN IS THE TNT COVER REVEAL? It’s going to be on Friday the 13th!!!! TEN DAYS!!!! The real one is just as good, if you can believe that. Also today is six months exactly until the book comes out!!!!!! LET’S PARTY LIKE WE’RE TERRIFIED!!!!! negative-pessimist asked: Hi Lauren! This is a very random question but do you have a playlist for TNT/a playlist of songs that helped inspire TNT? If you’re super ahead of the game you can even listen to the sequel playlist here. This one is a lot longer and very fluffy. It’s that kind of book. There’s a lot of Taylor Swift. Anonymous asked: Was it harder to write or edit The Next Together? I found editing really fun, actually – except for copyediting, when the final checks of everything are done. That just made me feel bad for all my grammar and factual errors! I really like editing because it really feels like you’re improving your work and stretching the plot as much as you can. I love the feeling when my editor/agent points out something that could be done differently, that will dramatically make it better. It’s a great oh, duh moment, and improving on their initial suggestion (which might be something like ‘maybe add more tension to this scene’) is really, really fun. That said, I love writing too! There’s nothing better than writing something completely original and making yourself laugh/cry/scream/sigh happily at something. I think writing is harder though. It’s a lot more stressful than editing, because I’m a big worrier, so I spend a lot of time panicking that I’m writing something rubbish (whereas with edits I know exactly what my editor doesn’t like, so I’m a lot happier with it and not second-guessing myself). It’s a huge gamble for anyone, to spend such a significant amount of time working on a project that you have no guarantee anyone will like, and that doesn’t change just because you’ve successfully published one book! I think that makes writing new things a lot harder than editing, for me. laurenjames: Only 174 days to go!!!! My cover and first chapter reveal is happening tomorrow at 4pm!!! It’s going to be on some tumblr book blogs and review sites so KEEP YOUR EYES PEELED. As you can see, it was posted practically everywhere,but just in case you haven’t seen it yet…here it is! If you want to read the first chapter, click on the link to see it in full! I think the reason I love my cover so much is that it’s not super girly and pink and glittery. It’s a romance, so I could easily have ended up with a cover like that…but instead I get this! It’s very non-gendered and sophisticated and classy and I LOVE IT. Last week I blogged about coverflip, about how female writers tend to get more fluffy and less serious covers compared to similar books written by men. I think it’s a great sign that my cover escaped that. It could be used for a book by a male writer too, like David Mitchell’s Cloud Atlas! It’s so AMAZING. I was tagged in a few memes, so I thought I’d do them in one post! I was tagged by negative-pessimist​ in the Female Authors meme. 2. Favourite book by a female writer? 3. Favourite quote by a female writer? 6. Favourite female author of your childhood? Probably Jacqueline Wilson or J K Rowling. 7. Favourite living female writer? A. M. Homes is excellent. 8. Do you have a not very known favourite female author? Share her with us! I’m gonna say e. lockhart, because however famous she is, it’s not famous enough. 9. Bonus: Which female author would you have loved to meet? What one question would you have asked her? I’m going to meet Emily St. John Mandel this week to get my copy of Station Eleven signed (which has just been longlisted for the Bailey’s Women’s prize for fiction!!). I tag anyone with an s in their username to answer this! I was also tagged by catherine-doyle​, chronicintrovert​ AND blackbirdonthewire​ to do the Terrible Titles tag, so I thought it was probably about time I got around to that…. You are ridiculous and I love you. Hmm. #8 is actually kind of good, but #7 is the most accurate, I think. I tag my editor and fellow author A J Grainger/book-sleeves-and-tea-leaves​, because I want to see what else Captive could have been called! IT’S ALSO ON THE BOOK DEPOSITORY AND AMAZON.COM!!!!!!!!!!!!!!!!!!!!! littlebundleofbooks: Seriously I get so many feelings about it when I’m listening to Lorde (and also just all the time tbh). 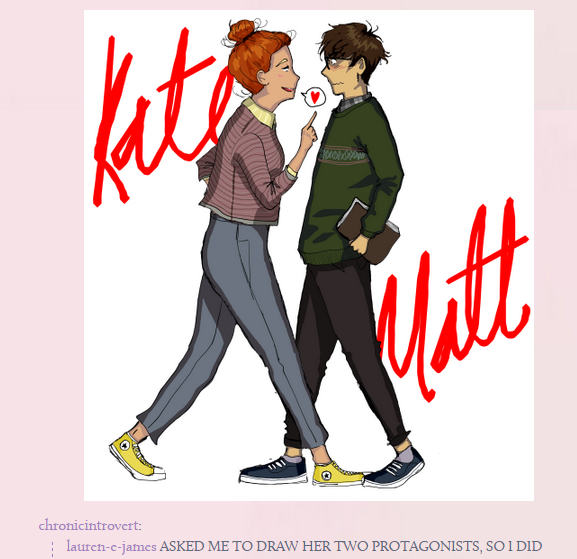 Look, I’m just here to fangirl and think about Kate and Matt (and Matt’s hair), y’know? I’m gonna die. This is the end. I’m done in. YOU GUYS ARE THE BEST COMMUNITY EVER. Is this not MADNESS? Tumblr did this. This is all tumblr. And yes, I’m not just satisfied by one actor for fancastings. I will collect as many actors as possible and combine them to create the one optimum fancast of my characters, in a kind of ‘his arm’, ‘his nose’ pick-and-mix. It will be my finest creation. Your message cheered me up immensely too! Thank you! nataliebina: YAY LAUREN THIS IS SO AMAZING I AM SO HAPPY YOU HAVE GOTTEN HERE WITH THIS BOOK! I love nothing more than stories of great writers who started with great programs like NaNoWriMo and have taken their stories far. You are an inspiration, and I can’t wait to read The Next Together! thebookbangtheory: Omg I saw this recommended to me on Amazon and thought “huh, thus sounds like an interesting concept, maybe I’ll get this with my next paycheck”. 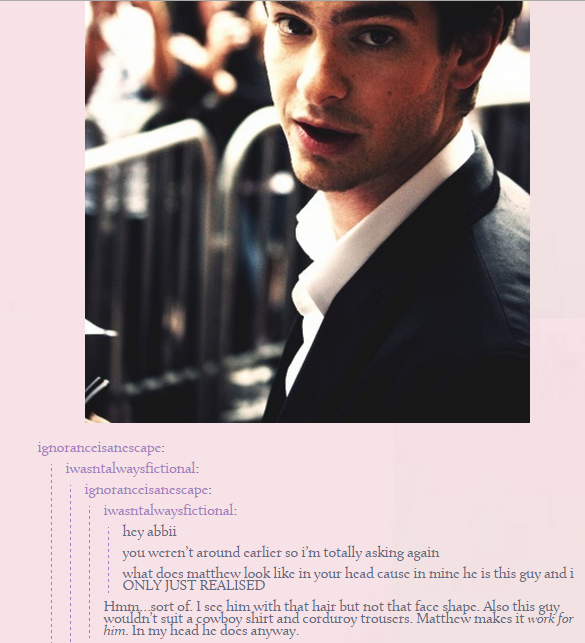 Never would’ve guessed it would’ve come from someone on Tumblr! That’s amazing!! Congrats, Lauren!! 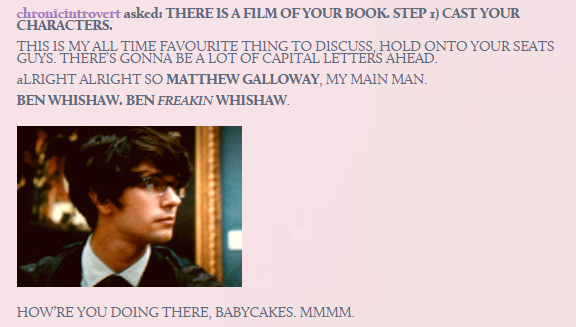 kirstysmash replied to your photoset: The first chapter was intriguing! Can’t wait until September 3rd! GUYS YOU ARE ALL INCREDIBLE, THANK YOU. I’m so happy right now I don’t know what to do with myself. Thank you so much Cat!! I WROTE A REAL BOOK! Today I’m interviewing Lauren James, incredibly sweet fellow Fearless Fifteener and author of THE NEXT TOGETHER, a remarkable reincarnation romance that I was fortunate enough to read recently. Add THE NEXT TOGETHER (Walker Books in the UK, 3rd September 2015) to Goodreads or preorder on Amazon. THE NEXT TOGETHER has such a brilliant, twisty plotline! How did you manage to keep everything straight? Did you outline? Thank you, Marci! It was hard to keep everything in my head, and after a few confused conversations with my agent, where neither of us knew what was happening, I taped about five huge pieces of paper together, laid them on the floor, and wrote out the plot in each timeline. There was lots of post-it notes and highlighting and multi-coloured notes used to keep everything in order! I think if I’d realised how complicated to would be to write a three timeline, historical, time travel novel, I might have saved the idea until I’d already written one or two other novels. As it was, I chucked myself straight into the deep end as an author. A good portion of this story occurs in the past. How much research did you have to do in order to stay historically correct? There are three storylines in The Next Together, each about a different life of my main characters, who are reincarnated throughout history. One is set in the future, one in 1854 during the Crimean war, and one in 1745 during the Jacobite Uprising. So I did a lot of research to make sure I didn’t embarrass myself! I visited one of the locations, Carlisle Castle, to make sure my descriptions of the layout were accurate. I also read a lot of primary sources, usually diaries and letters from people around at the time, as well as history books about the time period. I wanted to make sure that my writing was a little realistic, but I didn’t go hugely overboard with the research – I think the story is more important, and I didn’t want to make the dialogue too heavy and historical, especially for a book aimed at younger teenagers. It’s a historical novel, but it’s hopefully exciting and modern and funny regardless of that. Hopefully I found the right balance between accuracy and plot! Can you tell us a little bit about your hero and heroine? Kate and Matt are reincarnated multiple times throughout history, and they always find each other and fall in love. Kate is sassy and rude and rushes into things without thinking, and Matt is more contemplative and careful and a little shy. He thinks Kate is incredibly cool. Kate thinks Matt is exactly her Type. They’re both a little silly and ridiculous, but they love each other a lot, and have a great time finding out just how much in every storyline. I write at night, usually from around 7pm – 2am. I listen to playlists I make for each book, and I chew gum and write and write and write. I usually know how a story is going to start and what’s going to happen in the first half, but I don’t know the rest until I get there. I write dialogue first, starting with funny or romantic lines that I’ve noted down beforehand, and I build scenes around them. I write from beginning to end, and I don’t let myself jump ahead to other scenes however much I want to. I just force myself through the awful bits. It takes me about 2 months to write a first draft, and then I leave it for at least a month before I go back to it and work on edits. I love Rainbow Rowell, Garth Nix, Neil Gaiman, but some of my favourite recently published authors are Robin Talley, Alexia Casale, Noelle Stevenson and Lisa Williamson. I have so many favourites it was hard to pick just a few! If you want some more recommendations, my favourite books of 2014 are here. Lauren James is a scientist by day, writer by early hours of the morning. She graduated in 2014 with a Masters degree in Natural Sciences from the University of Nottingham, where she studied Chemistry and Physics. She now lives in the village of Berkswell, West Midlands. 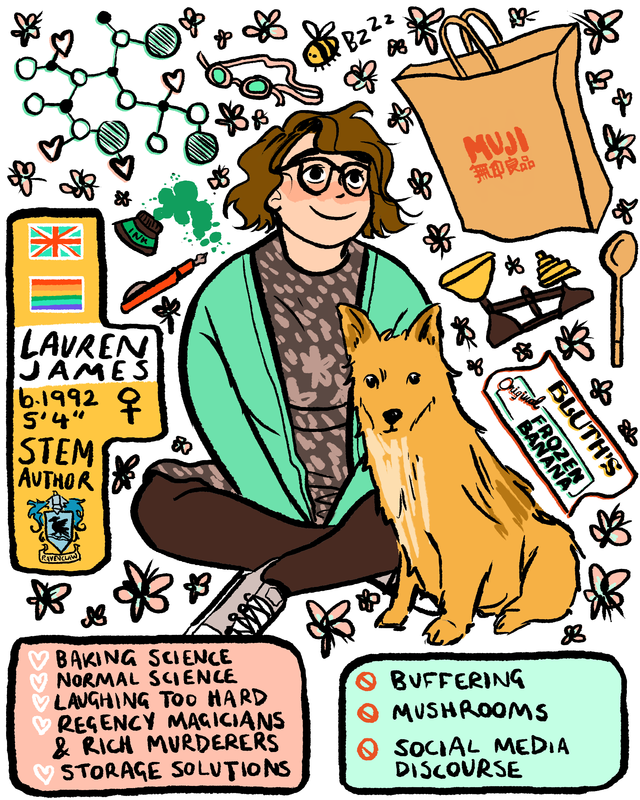 You can find her on Twitter at @Lauren_E_James, which she mainly uses to fancast actors as her characters and panics about all of the overly ambitious plans she has for her PhD, or her website at http://lauren-e-james.tumblr.com. You can find Lauren on Twitter, Tumblr, or WordPress. Marci’s book THE ONE THING is also excellent and publishes in September by Disney, so be sure to check that out! *klaxon noises* WOW WOW WOW WOOOOOW THE NEXT TOGETHER JUST HIT 1000 ADDS ON GOODREADS!!! THIS IS MAD AND BRILLIANT AND WONDERFUL. THIS BOOK ISN’T EVEN REAL YET AND WON’T BE FOR FIVE MONTHS!!!!!!! THANK YOU TO EVERYONE WHO HAS ADDED IT, YOU ARE MY HEROES!!! tilly-and-her-books: STOP WHAT YOU’RE DOING. Have you heard about this book? Well listen up. This is The Next Together by Lauren James. This is the cover reveal and I’m so excited to be sharing it with you because look at how gorgeous it is. Howmany times can you lose the one you love? I also have an excerpt to share. It’s a very special extract from the book! livinglovinglangston: I AM SO EXCITED AND I JUST CANT HIDE IT. brainy13sweetheart: OH MY GOD. OH MY GOD. OH. MY. GOD. Listening to the new Mumford & Sons album while I do my last ever ever checks to #TheNextTogether. Every post it marks a change…..oops……………. I can’t tell you how much I love getting messages like this! Thank you so much for being as excited about my book as I am. Kate sat at the desk in her dorm room and stared at the concrete wall. She felt like something hugely important had just happened, but she wasn’t sure what. Today I went to inkslingerbooks to sign all my proofs ready to go out to bloggers, whaaaaaaat! Maybe the next together will be different..
At a conference my publishers held last week, The Next Together went out in the goody bags! Credit to Wei Ming Kam for the pic! I don’t know if this is exciting to anyone but me (I find the smallest most boring details interesting) but The Next Together is now available for preorder on kindle, ibooks and kobo! Yay! So ridiculously (amazingly, absurdly) you can now buy a The Next Together mug from a shop set up by an author to promote UKYA books. Isn’t that so cute!! Look at it!! You can get loads of other UKYA stuff too, including mugs with quotes by other UK authors. Beware, if you visit the shop, you may spend all your money. Enjoy! I made myself into a classy anemone mermaid lady, because how can I not jump on a mermaid trend set by maggie-stiefvater?? She’s flagging down Matt the octopus merman, who in this reincarnation is working as a seahorse taxi driver. Kate makes very lewd remarks about all of his tentacles when he drives her anywhere. He doesn’t mind a bit. At an event at my publishers last month, my cover designer Jack shared some of the different versions of the cover for The Next Together. Aren’t they so cool? Pictures taken from the lovely UK Shadowhunters, Walker Books, and Andrew Hall. I TOTALLY DON’T MIND AT ALL. I will shamelessly always answer my own questions. What alignments would all your characters be? Which is your favourite to write? Definitely any of the chaotic characters. They are so hilariously wild and unpredictable. Which would you love to write in future? Lawful Evil. I think the boundary between good and bad, in that grey area between a hero and a villain, is the most interesting. Which is the most boring? Mate, Lawful Neutral is so dull. Like, what is even the POINT of you? When my agent was skimming through a huge inbox full of manuscripts, this apparently caught her eye as something original, that she’d not seen before. It wasn’t enough to persuade her to represent me, but it gave her a push to read the whole thing. So I would say that you need to find something that makes your writing unique, even if it’s only a small element of the story. Make sure it’s in the first few chapters, along with all of your very best writing, because when you’re querying that’s what agents will read. Read your favourite books, and try to narrow down a few reasons why you like that book so much. In 2090 Kate meets a new researcher in her biology lab and discovers that together they bear a startling resemblance to her mysterious great aunt and uncle. Meanwhile, Kate keeps recalling memories that aren’t hers: the siege of a castle, a kiss that never happened on a battlefield from a history book.In each lifetime they are fighting for what is right, but however hard they try to help, will it ever be enough to stop them being brought back once more? Revealing the power of love regardless of circumstance, this book looks at the determination of two people in the face of growing turmoil.This book should appeal to students; people who grew up speaking the language of the internet, who enjoy science fiction but also have a soft spot for Jane Austen. The Red Earth Rolls was written by a teenager, for teenagers: I’m currently in the third year of a Chemistry and Physics degree at the University of Nottingham. I wrote this novel after becoming increasingly frustrated by the glamorised science often found in media. This prompted me to write a more accurate story about scientists, and my love of history and genealogy brought forth another element. The Bookseller called me ‘compulsively readable’ today, so I think I’m gonna get that tattooed on my arm. The lovely bookpigs mentioned my book in her latest video! SO EXCITED ABOUT THIS. Get a free signed bookmark! I will send anyone who preorders a physical paperback copy of my novel The Next Together a fancy signed bookmark. This is open internationally. The offer will run until the book is published on September 3rd 2015, or until I run out of bookmarks, whichever comes first. You can check whether bookmarks are still available here. Hello! I’m so glad you’re excited about TNT! I wrote a blog post about getting my book deal here. It was about 5 months after I signed with my agent before we submitted to publishers (we spent a lot of time editing the book first), and then two weeks before I had offers from publishers! I found editing weird at first, but I really enjoy it now! I love getting editorial notes back, and feeling yes, that’s exactly what I need to do to make it better. It’s a really satisfying feeling. They haven’t! We’re still discussing final changes and designing a few bits and bobs on the pages. I think they’ll be ready in July or August. I am giving away a signed ARC copy of my YA novel The Next Together, which will be published in September. This entry was posted in Uncategorized on 03/02/2015 by Lauren James.